Rob Ford Tweets A Donald Trump Endorsement. Hang On, What? 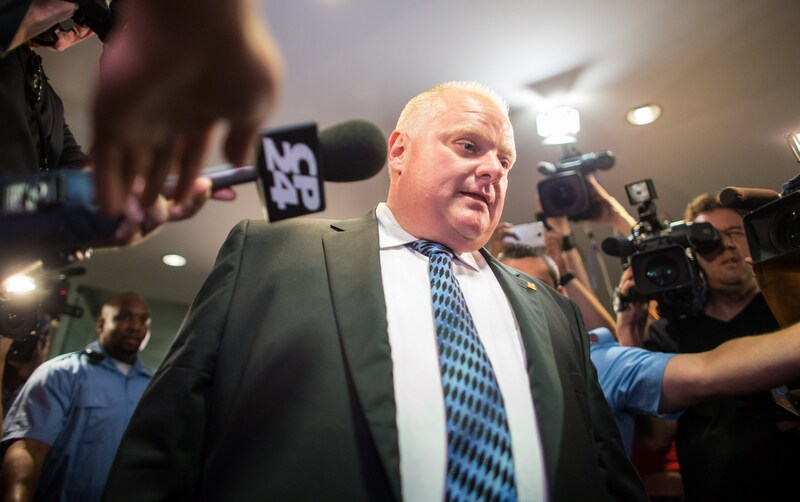 Former Toronto Mayor Rob Ford tweeted a Donald Trump endorsement on Friday. It was the first tweet sent from Ford's account since he passed away on March 22. Although Ford lived and worked in Canada, this tweet was clearly a message for the United States and it showed that even those outside of the states are joining the Trump Train. The tweet from Ford's account included the simple message of "Go Trump Go!" Seems like a benign message, until you realize that Ford has been dead since March and not a single tweet has appeared on his account since the day of his death. How did this happen? Is Trump hacking Ford's account? Not quite. In Ford's Twitter bio, it indicates that his account is now a memorial account and all tweets are created by the Ford family. Phew! We can rest assured it's not the ghost of Ford pledging his allegiance to Trump. But it's still pretty confusing when you see Ford's name ahead of the pro-Trump message. Apparently the Ford family was elated to see that Trump invoked Ford's old mayoral campaign slogan in one of his speeches in West Virginia. In his speech, Trump vowed to "stop the gravy train," which was reportedly Ford's message in 2010 when he ran for Toronto mayor. When running for mayor, Ford pledged to "stop the gravy train" at Toronto City Hall, according to the Toronto Sun. Ford's family tweeted a link to the Sun article that made the connection between Trump's rhetoric and Ford's previous campaign slogan. It's unclear why Trump would use this slogan from Ford now, and it's unclear if Trump was even aware that he was quoting Ford. But whatever his reason, the Ford family was happy to see the presumptive Republican Party nominee honoring the late Ford. Ford died from cancer at the age of 46, and not long after his death, people began comparing his political style to Trump's campaign. Throughout his time in office, Ford was exposed for smoking crack and became known for his hardball, sometimes crude way of politicking. Because of this, many said that Trump followed Ford's lead and that Ford essentially paved the way for Trump's outrageous presidential campaign. Others have recognized the uncanny similarities between Trump and Ford, even calling Trump the "American Rob Ford." As Trump continues his momentum forward in the U.S. presidential election, it's interesting to see how the connections with Ford continue to emerge. It's clear that Trump and Ford have had a friendly relationship for many years, but that didn't make it any less shocking to see a pro-Trump tweet from Ford on Friday. Will Trump continue with the Trump Train or the Gravy Train? Either way, I'm admittedly still a little creeped out by the whole thing.